In November 2010 Oshkosh Defense (NYSE:OSK) received another contract worth $780 million for the production of 4,773 family of medium tactical vehicles (FMTV). In December the company was awarded a separate contract worth $513 million to supply 2,050 FMTV medium trucks (plus 1,650 trailers) to the U.S. Army National Guard through 2013. Since being selected as the supplier for the five-year firm-fixed-price contract, Oshkosh received orders for over 50% of the program’s projected volume of 23,000 trucks, with orders accumulated to more than 16,000 FMTV trucks, trailers and enhanced armor protection ‘B Kits’ at a total value of more than $2 billion. The FMTV is a series of 17 models ranging from 2.5-ton to 10-ton payloads. Vehicles feature a parts commonality of more than 80 percent, resulting in streamlined maintenance, training, sustainment and overall cost efficiency for the U.S. Army. Under two additional contracts worth about $60 million Oshkosh will also deliver 78 Palletized Load System (PLS) trucks and trailers. The PLS is the backbone of the Army’s distribution and resupply system. Since its introduction in the 1990s, Oshkosh has produced more than 6,000 PLS trucks and more than 14,000 trailers. The most recent variant, Palletized Load System (PLS) A1 vehicle rolled out of Oshkosh assembly line on December 6, 2010. The PLS A1 features a Long Term Armor Strategy (LTAS)-compliant cab that is common with the Heavy Expanded Mobility Tactical Truck (HEMTT) A4 for improved fleet commonality. Other PLS A1 upgrades include a 600-horsepower engine, electrical upgrades and incorporation of an Oshkosh TAK-4 independent front suspension for improved off-road mobility. Another vehicle modernized underway at Oshkosh in support of Army transportation is the Heavy Equipment Transporter (HET) A1. This configuration includes increased horsepower, higher-capacity front suspension, a larger vehicle cab, electrical upgrades and air conditioning. Since receiving its first contract for the vehicle in 1976, Oshkosh has produced more than 3,000 HETs for the Army. 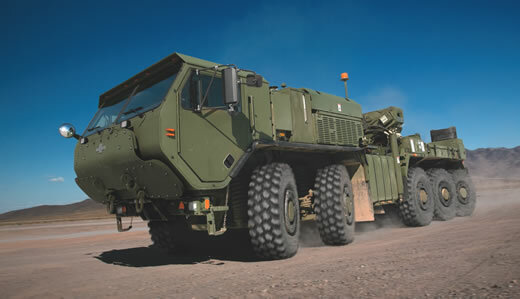 As part of the field supporting for these vehicles, Oshkosh is already refurbishing heavy transporters under the Army TACOM Life Cycle Management Command (LCMC) ‘Theater-Provided Equipment Refurbishment’ (TPER) process. This program, performed by the manufacturer, is returning battle-damaged vehicles to full mission-capablility at the company’s Kuwait facility. Oshkosh has recently been awarded a $11 contract to process additional 140 vehicles through TPER. According to Mike Ivy, vice president and general manager of Army Programs for Oshkosh Defense, refurbishment of vehicles in Kuwait reduces the maintenance cycle time by weeks. To date nearly 1,500 heavy vehicles and trailers were refurbished at the Kuwait facility. Under the new contract the facility will refurbish the Army’s Family of Heavy Tactical Vehicles (FHTV) including the Heavy Expanded Mobility Tactical Trucks (HEMTT), Heavy Equipment Transporters (HET A1) and Palletized Load System (PLS). Oshkosh also will refurbish M1000 HET Trailers, which were not originally produced by the company. The vehicles and trailers being refurbished were operating in support of Operation Iraqi Freedom. 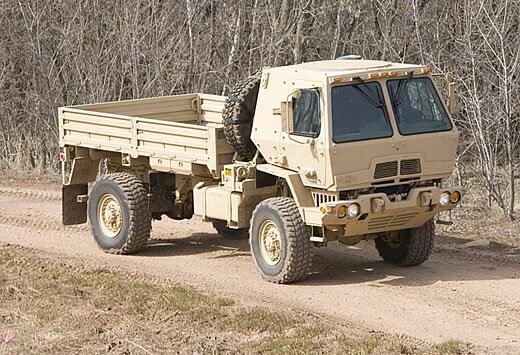 The order extends Oshkosh’s TPER work until May 2011 and is valued at more than $11 million.